The 22nd Battalion spent the winter months of 1916/17 alternating between the support trenches and firing line in the Flers – Gueudecourt area on the Somme. A welcome respite from the atrocious muddy conditions was experienced when the temperatures fell in mid-January and the heavy frost turned the ground hard as iron, though of course bringing new challenges for the infantrymen such as how to keep warm and avoid frost-bite. The shell-pitted region was now a field of ice many feet thick, which the men dug out with their picks and melted on fires for warm drinks. It was so cold that damp hair froze, and the bread had to be thawed by the fire before it could be cut. As with the other battalions of I Anzac Corps at this time (as described in Bapaume: AIF Divisions), their task was to keep pressing the Germans and keeping them under strain for the resumption of the offensive that would begin when the weather improved, leading up to the great 1917 Allied offensive on the Aisne and at Arras. This plan of local pressing would soon change when it became clear that the Germans were withdrawing to a new defensive position and the 22nd Battalion would be involved in the pursuit of the enemy to the Hindenburg Line. On the 1st February 1917 the 22nd Battalion moved to the nearby Le Sars sector facing the Butte de Warlencourt, an ancient burial mound providing the Germans with elevation and hence good visibility of the surrounding countryside and which they fortified as part of their strong Gird Trench and Gird Support defensive system. Alternating with the 23rd and 26th Battalions, the 22nd’s time in the firing line would predominately be patrolling to locate enemy posts and assessing the enemy activity within this sector. On the 24th February telephone messages were received from British HQ suspecting that the German Army was withdrawing from a number of areas on the Somme. That night and on the eve of the Battalion’s relief, orders were received to issue ammunition and bombs in preparation to send out strong patrols for an advance along with the 21st Battalion to occupy Gallwitz (Gird) Trench. The fog made it difficult to navigate, and when the right hand companies of the 22nd faced thick uncut wire entanglements, they sent back for duck-boards to lie across it. No enemy was encountered and they were ordered to complete their night’s task by reconnoitring and placing posts to encircle the ruined village of Warlencourt. Although the enemy was light in numbers, there were still casualties. At dawn in Little Wood a patrol from C Company was engaged and a stray bullet detonated a box of bombs being brought forward causing 16 casualties killed and wounded. Several men were also wounded by booby traps left by the enemy in the now unoccupied trenches. The following day brought fine weather and although no shelling, many Germans could be seen in the vicinity of Malt Trench outside of Warlencourt. Resistance was being encountered on the left of the I Anzac Corps front held by the AIF 2nd Division, and Maj-Gen Gellibrand, in temporary command of the Division, decided on a determined advance and to take Malt Trench which was the enemy’s most important defence on this part of the front. The 5th Brigade was met with fire from several machine guns and casualties were heavy, so the 6th Brigade was quickly summoned to attack with little preparation and attacked with two companies each of the 21st and 22nd Battalions. The two companies of the 22nd Battalion were led by Captain Cull who had earlier audaciously reconnoitred the position during the day, noting that the German wire had not been cut. He was informed however that there would be no artillery support to cut the wire and that the attack must proceed at all costs at once. Scouts were sent out to discover passages through the wire. As C and D Companies reached the top of the hill outside of Warlencourt some fifty yards from the entanglements, the Germans in their trench opened fire with machine-guns and rifles. Capt. Cull ordered his men to lie in shell-holes and wait for reports from the scouts, but when no report came, he gave the order to charge. His impetus carried him over the first stake but he got entangled in the second where his hip was shattered by a bomb. Lieutenant Corne and 1109 Pte C Martin (Military Medal) tried to extricate him from the wire, but Lieut. Corne was hit and killed. Twenty of the men found an opening in the entanglement and under the leadership of 2151 Sgt J Harwood (photograph above) entered an unoccupied portion of Malt Trench but were shortly afterwards driven out by machine gun fire. Capt. Cull and several of his men were captured and made prisoner of war, and in all some 50% of the men engaged in the failed attack became casualties. During this action four men from the battalion were awarded for their gallantry including the wounded Sgt Harwood who was awarded the French Croix de Guerre, and scout 4531a Pte HR Lucas (Military Medal). 2346 Sgt PT McCormack (5th/22nd) was awarded the Military Medal for distinguished gallantry in command of his platoon under heavy Machine Gun fire. The following day the 22nd Battalion was relieved by the 24th Battalion under the cover of fog to Shelter Wood Camp where it remained for the rest of the month, resting and receiving the next draft of reinforcements. On the 8th March the 22nd Battalion relieved the 23rd Battalion in Malt Trench (A & C Companies), Malt Support (B Company) and Layton Lane and outposts as the German Army conducted its strategic withdrawal. Throughout his retirement the German policy was to man selected strong posts and hold them with machine gun crews. These crews were often scattered along a continuous trench, all protected by wire and were very difficult to locate. Patrolling was dangerous and it was in this manner that Lieut. Massie (photograph below) went missing in front of the then uncaptured Grevillers Trench, and was later reported killed in action having been taken behind German lines. 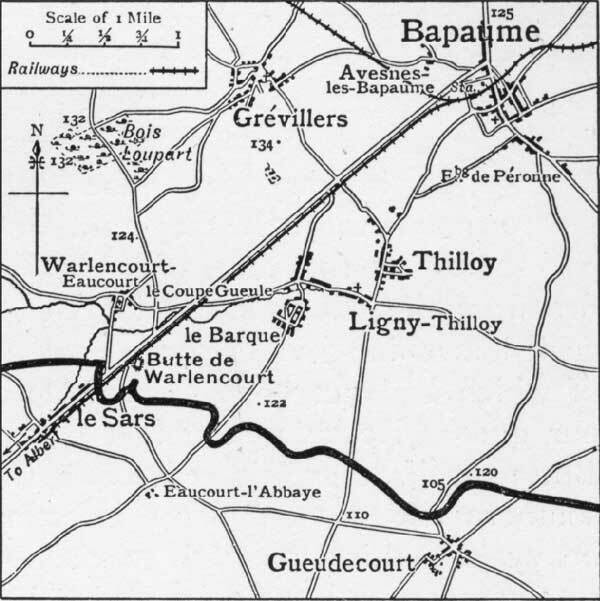 On the 13th March the 6th Brigade was ordered to move forward and take up positions along the Warlencourt Road, with the 22nd Battalion to occupy positions in Le Barque village and Malt Trench. Early in the morning of 26th March, B and C Companies moved into Bapaume and took over from 20th Battalion, with a plan to billet in the Town Hall. However upon arrival they found that the Town Hall (photograph above) had recently been destroyed by a clockwork mine, so the two companies were given the task of looking for survivors and shovelling the Town Hall off the road. A similar mine entirely destroyed the dugout system on the edge of Bapaume that was used by the 6th and 7th Brigades as their headquarters, though fortunately when the mine went off most of the 7th Brigade staff had advanced to Vaulx-Vraucourt. Orders were subsequently given that dugouts and houses left intact by the enemy must not be used by staff or troops. On the 27th March the 22nd Battalion was relieved from Bapaume and re-joined the 6th Brigade in Mametz Wood and huts in Divisional Reserve. For the 22nd Battalion along with the other battalions of the AIF, the advance in pursuit of the withdrawing German Army brought a welcome relief from the grey mud of the Somme trenches as it progressed across the open green countryside towards the Hindenburg Line. However for the 22nd it would still be in the trenches around Warlencourt that they would be most tested during this tour, as they would not be called upon to participate in the open country fighting that would dominate the fighting for the other Australian battalions during March 1917. During this tour of front line duty around Bapaume the battalion had suffered some sixty casualties, with twenty-six men being killed. By the end of March the AIF would be facing the Hindenburg Line, and the 22nd Battalion withdrawn to the rear to prepare and practice for the next phase, Bullecourt and the Arras offensive of 1917.